1. What a great adventure! When can I go? 3. That man (Tom, my husband) talks you into the craziest things, Patty! Now our adventure has become a memory, but what an adventure it was for me. My whole sailing experience has been limited to Hobie Cat racing, sailing with friends, and charter sailing. No night sailing, no passage making, and certainly no tidal sailing. Don’t get me wrong, charter sailing is a wonderful experience. It makes sailing available to those who don’t have the time, money, or committed sailing companions, to invest in a personal sailboat. However, charter sail companies restrict the scope of their charters, and do not allow night sailing, with good reason. Charterers may actually be decent sailors, but the nature of chartering is to board a different boat each charter, an unfamiliar boat with different equipment in various states of repair. In addition, often charterers have busy lives and can only spare a couple weeks per year to sail, so a few days are always spent dusting the cobwebs off one’s sailing skills. Leon Schulz, on the beautifully refurbished Regina Laska, presented a wonderful opportunity to Tom and me. We would board the 48 foot Hallberg-Rassy 46 in Neustadt in Holstein/Germany, motor down the Kiel Canal, and out into the North Sea, and sail nonstop as far down toward France as winds and tide allowed. Then, we would make our way across the English Channel to the Isle of Wight, where Regina Laska would have some ‘fitness tests’; Leon plans to use Regina Laska as a school for advanced sailing students. Also, on the Isle of Wight, Tom and Jan, our 4th crew member, would stand for their RYA Coastal Skipper examination in the waters of the Solent, which is renowned for its difficult tidal currents. During this trip, Leon, who has been a RYA Yachtmaster instructor for the past several years, guided us through the Yachtmaster course with lectures on tidal theory, pilotage, weather, charting, passage planning and making, safety at sea and electronics – VHS, radar and GPS use. It was a whole new level of sailing, and quite a challenge. So much to learn, but it is very satisfying to understand some of this very complicated topic. Sailing is a grand subject; you never know it all; you can continue to learn new aspects your whole life through. And, what a great way to learn advanced sailing! Although I have assisted on many charter sails, these sails have always been in non-tidal waters: the Caribbean, Lake Superior, Greece and even Denmark and Sweden have negligible tides. I had read the textbook Yachtmaster for Sail and Power by Allison Noice, at Leon’s request, before our trip. While the subject was very interesting, I could not relate to many of the chapters, particularly ‘Tidal Heights’, ‘Tidal Streams’ and ‘Passage Planning’. As with many subjects I have studied, these chapters made perfect sense while I was reading, then, 10 minutes later, all the knowledge had drained from my brain. 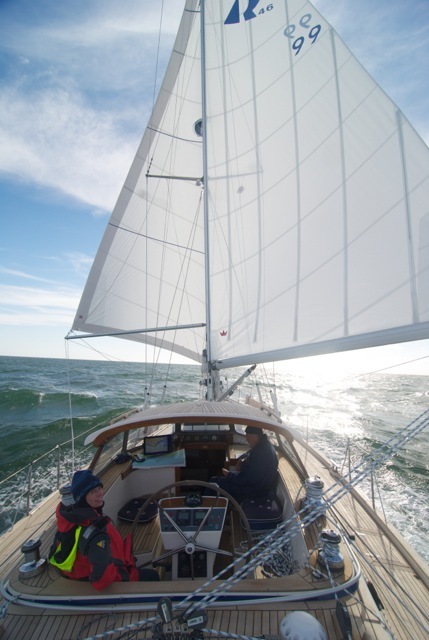 The unique experience of ‘learning while sailing’ aboard the Regina Laska was perfect. Now, I could see the actual strength of the tides on our boat’s course—more effect than the wind! Incredible! When we headed from the Kiel Canal into the North Sea, we heard gale warnings. Visions of The Deadliest Catch reality TV program filled my imagination, would we really be fighting for footing on an icy, perpendicular deck? Leon, with all his experience, was excited; he knew the wind before the gale would carry us down to France, and it did! We sailed for 3 days straight before landing in Dunkirk. Three days included two nights, of course, and night sailing was another thrill. We were all to stand watch in turn as Regina Laska slid through the dark water. I felt horribly responsible for this beautiful sailboat; Leon took pity on me and sat by my side almost the whole time I was on duty. It was magical to see the lights of cargo ships, tankers, fishing boats, cruise ships and ferries come and go. I was extremely thankful for modern technology: the AIS system that allows the watch person, with a touch of a finger, to ID the moving lights in the darkness and let you know what you see, be it a buoy or a ferryboat, its speed and size. The best part of that system is the knowledge of when you will intercept the other boat. Peace of mind, relief! Not so fast, though. There may be other obstacles lurking in the dark – I was hyperaware that huge containers can fall off cargo ships without radio beacons to warn night sailors. The navigation technology, and Leon’s knowledge, made the night sailing a lovely adventure, even in all the North Sea and English Channel traffic. Our sailing course included charting our own passages. This takes forever the first time you try. We were gratified to know that the tidal stream theories actually work, and we made it across the English Channel, into several secondary ports and around the Isle of Wight, arriving at the correct time of height of tide to enter the harbors and marinas. Who knew? These amazing feats of seamanship were performed under Leon’s watchful eye. I felt much more secure with a knowledgeable sailor/friend/instructor on board than if Tom and I were sailing through these tricky seas the first time by ourselves. Novice sailing experiences can be a real strain on a marriage! Safety at sea was emphasized. We practiced man overboard drills, under sail and power, again and again, rescuing a poor, waterlogged fender. We practiced taking bearings and blind navigation. We studied weather theory and tried to predict its effect on our course. There is a lot to learn, and our two weeks on the boat reinforced the textbook. I think we experienced everything the text discussed, except a helicopter evacuation. In the Solent, we observed a Coast Guard rescue, saw three strandings, and heard two Maydays, one for fire and one for sinking. Thank goodness, we were not required to experience yachting disaster personally. Tom and Jan spent 12 hours with Alan Stewart, a RYA Yachtmaster examiner, who administered the the Royal Yachtmaster Costal Skipper exam in the Solent, off the Isle of Wight, Captain Stewart’s home waters. Captain Stewart is a perfect, calm examiner, even looking the part, right down to his pipe and Scottish accent. I do not have the actual sailboat handling experience myself, so I was an observer. The act of taking a test, in itself, even observing a test, is a learning experience. Mistakes are made, and the students will remember the mistakes more than what was done correctly. So it was with Tom and Jan. They prevailed, passed the test, and we had a wonderful celebratory dinner that night. Then, another night sail up to Ipswich waters in Essex, England. Again, the wind and tide were our friends and we arrived several hours earlier than we planned. We actually had to wait for the tide to rise to enter the harbor at Walton-on-the-Naze. There, we parted from Leon and Jan, and completed our journey home, through London. Leon and Jan continued up to Edinburgh, Scotland, for more adventures. We returned home to Minnesota, and a flooded basement. Somehow, Edinburgh sounds much better!